Munchkin Land Designs: Happy Birthday!! Designs Giveaway!! A year ago when I was chatting with family and friends about starting Munchkin Land Designs, I never dreamed that this would be such a joy in my life. I love the interactions with clients, I love listening to their ideas and helping them create something beautiful for their blogs, I love the creative outlet it brings me. And yet, none of it would be possible without all of you lovely, lovely people! Thank you for this past year, thank you for the positive interactions, thank you for allowing me glimpses into your lives, and most importantly, thank you for entrusting me your ideas and visions. This giveaway is for you! 1 – Twitter Background design. You’ll have to follow me @In_Munchkinland to learn how to enter for the free Twitter background giveaway. 1 – Basic Blog Design which includes your choice of a 1, 2, or 3-column design, a custom background, a custom header, and a signature. 1 – Deluxe Blog Design which includes everything from the Basic package, plus four unique sidebar titles and implementation of a fun font of your choice. 1 – Elite Blog Design which includes everything from the Basic and Deluxe packages, plus unlimited sidebar titles, a navigation bar or buttons, and a blog button with “grab me” coding. Whew! Is that worth playing for?! I sure hope so! And now for the giveaway rules. In order to qualify for the blog design giveaways you must do the following. You must be a follower of Munchkin Land Designs, just click the Followers box on the right. If you have any questions, please let me know. You must leave a comment on this post by 11:59pm (MST) on Sunday, July 25th. Of course I’m going to offer you ways to earn more opportunities to enter in the giveaway! Pay attention… You can earn more opportunities by doing one, or all, of the following. You can grab the coding of the Birthday Bash Giveaway Button and post it to your own blog/site. Come back here and leave a link to that particular post/blog in the comments on this post. You can post about the giveaway, along with a link to the Munchkin Land Designs site, on Twitter or Facebook. Again, please come back here and leave a link to your Twitter or Facebook page. I will choose the four winners by Wednesday, July 28th and announce them here! I wish you all the best of luck and can’t wait to meet the winners! Oh my goodness -- All of your readers don't even know how exciting their life is about to get if they win!!!! Working with Jenn over the last year on multiple designs has been easy-breezy! She makes it so fun, good luck everyone!!! I'm a follower and I would LOVE to win this! I am getting married soon and am going to need to revamp the blog! since I don't do twitter, don't enter me for that one, but one of the other ones would be wonderful! Thanks for doing this sweet, talented friend! I'm a follower and would love to get to work with you! I am a follower and would love a blog makeover!! 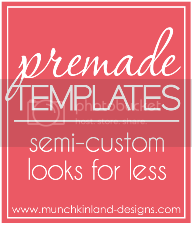 I would love to get a custom blog makeover!! I am a follower! I would love to win this!!! Such a personal giveaway!! I am now following you with google connect! omg I would love a blog makeover! I found you through Kelsey @ Seattle Smith's! I just started following and I am super impressed! I sooo want to win this!!! Now following you on GFC!! Button is on my sidebar!! Became a follower, button is posted, and a post about the giveaway can be found at that link! I am a new follower and would love to win this! Love your blog designs! How fun! I'd love to win a bloggy makeover! AMAZING giveaway! pick me pick me!! I'm a new follower! My blog could really use a makeover! I just read about this over at Seattle Simth's and I would LOVE a new blog desgin! I am new to the whole blogging world, highly addicted and would LOVE to have a fancy facelift!! Oh wow! Awesome giveaway! A blog new blog design would be fantastic! I'm a new follower! I put your button in my sidebar! I am a new follower - what a fun giveaway! I just looked at your previous work! Your work is amazing! Oh my goodness.. how generous!!! Love your deisgns!!! I would love to win a blog design, I defintily need a blog makeover!!!! What a great giveaway! Love the idea and love the designs! I've always admired Kelsey's of Seattle Smiths! Hi! I'm a new follower and just love your work on several of my friends blogs!! I posted your contest button on my blog too! Hmmmm this seems fun! I'll be happy to win or just happy to see what other fun things you do! I am now I follower, can't believe I wasn't already. Happy 1 year of official blog designing. I will try to post it on my blog this week! Love your designs. I LOVE Jenn!!! She is incredible. 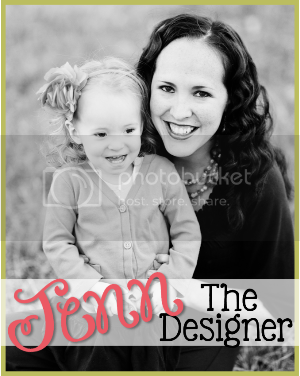 She has designed my personal blog & my business blog! I'm now a follower. You do some great stuff! I am a follower, I will probably post about it later and let you know! ooohhhh....I will need a redo after the girls are here!! And I am starting to homeschool !! Count me in!!! I will put it on my blog too!!! Who would turn down an opportunity to have your wonderful work displayed on thier blog. So, I am a follower, I posted it to facebook and I put it on my blog. I only have one problem. I am facebook stupid this evening and can't figure out the link to show it. Check out the blog though. Thanks, Jenn, for this great opportunity. What an amazing giveaway Jen!! Your designs are just beautiful!! 58 comments already?! sheesh! pressure's on Jenn - PICK ME! Love your designs! I'm new to blogging and could really use a makeover! I LOVE Jenn. She is great and you will love her too. She has done 3 of my designs and they were all great. You are in GREAT hands!!! I put the button on my blog and link the contest to you. I don't tweet, sorry!!! I'm a follower and would love a blog template! Your designs are too cute! I am a new follower! Your designs are amazing! I posted your button on my side bar! pick me! pick me!!! pick me!!!!!!! You've got great ideas :) I would loveeee to win!! Yay, I am so excited! You do such fabulous work! Congratulations on one year! I am a follower, I blogged, tweeted, grabbed your button, and facebooked! Jenn you are the BEST!!! I still enjoy my new blog design very much. Thank you again for all of your hard work and good luck to all! PS I'm about to have a giveaway for a GC! I'll mention your giveaway to my readers as well. What generous gifts! I just became a follower! I just pasted your button on the left hand corner of my blog!! posted your button on the left sidebar under giveaways. So cool! LOVE your designs, Jenn!! this is my blog post about the giveaway!!! I need a blog makeover SOOOOOO freakin' bad! I wanna win, and I follow you!